As you guys probably detected, I’ve been missing from the blogging scene for a while. I intend to use this place to document the news I come across, and the interesting learnings. While you can enjoy catching up on the news, it is more for me as a diary on what I come across. Yesterday Microsoft announced the rebranding of Skydrive into OneDrive. Personally, from a feeling and attachment perspective, I’ve already grown so familiar with Skydrive. On a personal level, i get 21GB of storage, if you’re new, you get a default 7GB. In any case, for teachers and students, you get Skydrive Pro. By the way, Office 365 A2 plan is free for all validated Education institution. In Office 365 A2, one gets 25GB of storage, known as Sky Drive Pro. Going forward, Consumer Skydrive is now called One Drive. and Skydrive Pro in Office 365, becomes OneDrive for Business. Check out the link announcement. Seriously to me, it is just a rebrand, but as always, when a rebrand comes, new perspectives about the services will come. Can’t wait to see the innovations impacting and improving the way we work, learn and play. I’ve been missing on the information super highway for about 2 years if you do realized. Most of you asked where have I been? I’ve joined another team in Microsoft Singapore, but I didn’t lose my technical skills, neither did I lose my evanglism passion. I still love applying technology and making big differences in everyone’s life. DPE was one of the most fun places in Microsoft. But I had to try something different, having done IT Pro Evangelist for 4 years and running TechNet and MSDN in Singapore. I won’t say I’ve done a super good job, but those in the Singapore community space, you know I have done a lot. However, I wanted to do more. I took the plunge and decided to try moving into Public Sector. I was the Accounts Technology Strategist for Defense and Homeland Security. It was an exciting role, but due to nature of the job, the conversations and technologies being put in place, you probably now know why I kept so quiet on the Cyberspace. Write to me if you like to know more about the technologies applied. Yes, Microsoft has a lot of technology in the Defense and Homeland Security space. About 4 months ago, I started going deep into Education. I am now the Business Development Manager – Education Partnerships in Public Sector. I have a nice boss, and I’m working hard to learn the robes. It is really cool and its like, going back to where I begun my career. For those close to me, you know I started my first few roles in Ngee Ann Polytechnic, taking on Tech Support Roles, to System Analysts role, and even a part time lecturer. That was cool. I am so looking forward to partnering with all the education institutions in Singapore. Microsoft has a lot to contribute and made available a lot of resources to Education. Write to me if you like to know more. The contents are of this blog represents the work and experiences I have been working it. It does not represent official positions of Microsoft in any ways. Please still refer to official information via microsoft.com web site. All materials shared here, are personal, and to aid in spreading the good word, and experiences of my job at Microsoft. Yes, and I was hyped up and on my way to attend the eagerly anticipated event each year. 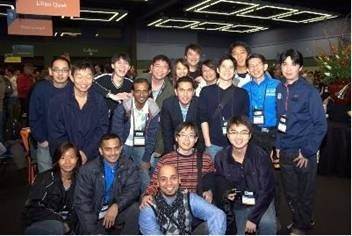 The 2009 MVP Global Summit at Seattle, Washington. This year’s MVP Global Summit was another breakthrough in the MVP Award Program history. We hosted some 1,500 MVPs in attendance and offered more than 680 technical sessions during the four-day Summit held at the Microsoft’s headquarters in Redmond, Washington. With all the concerted effort by the MVP Summit Team and of course with appropriate strategic planning, no task is tough for the MVP Summit Team. Held at the Washington State Convention & Trade Center (WSCTC), the opening ceremony brought the MVP community together and kicked start the 2009 MVP Global Summit with a great big bang! Toby Richards, General Manager of Microsoft’s Community and Online Support declared the 2009 MVP Global Summit opened and extended his warmest welcome to some 1,500 MVPs to the gala event, provided an update on the program development and outlined the plans for the next four-day Summit. This was followed by irrepressible Rich Kaplan, Corporate Vice President, Customer and Partner Advocacy, Microsoft who delivered an uplifting message on the ‘Voice of Community’ whereby he talked about the impact of the community, listening systems and the integral role of MVPs in these systems. Keeping up to the beat of the high-energy afternoon, MVPs were quickly ushered to the welcome reception area to meet up with their MVP Leads. All attendees were treated to a much-deserved and scrumptious feast and where they dined, wined, mingled and discoursed about the day’s earlier events. What was to follow in the next two days were a series of mind-boggling and intense deep-dive sessions whereby MVPs get to hone their technical skills through the 680 sessions offered during the conference. During the deep-dive sessions, MVPs get to interact closely with a variety of Microsoft’s product teams, sharing critical feedback to help enhance and improve the solutions that Microsoft offers to its customers and communities. A Rock ‘n’ Roll Star is BORN!!! This year, the attendee party was held once again at the Experience Music Project/Science Fiction Museum & Hall of Fame (EMP). The atmosphere was lively and happy, mixed with a sense of unity and communal bonding. Folks turned up in their rock and roll attire and made the day rewind to the good Elvis Presley’s days. Backed by a live band, the attendees were entertained to a three hour of Rock-a-raoke concert. Superb entertainment and sumptuous food gave great satisfaction to our MVPs and all! The vibrant and attention-grabbing performance by the MVP from the various countries kept everyone’s eyes glued on the stage. Will “Michael Jackson” be making a return appearance? No words could describe the heart-throbbing performance by Singapore MVP Sarbjit Singh Gill who belted out the hard rock band AC/DC’s song ‘Highway to Hell’ and wowed the crowd away with his ravishing performance and prowess vocal. Encore!!! Needless to say, that night, an undisputed KING of Rock ‘n’ Roll was born @ EMP and ruling his way into the hearts of thousands of his fans worldwide. As the 2009 MVP Global Summit came to a wind down, it was the emotional good bye to this engaging and enriching experience for all MVPs. Saving the best for the last, MVPs were treated to an array of keynote speeches delivered by the energetic Steve Ballmer, Chief Executive Officer, Microsoft who spoke on ‘Community Impact and Futures’ and Mike Nash, Corporate vice president, Windows Product Management, Microsoft who provided an eye opener on ‘Windows 7’. As one might thought those were just the icing on the cake, Mike Nash and Steve Ballmer held a surprise filming of MVPs shouting “I’m a PC and I’m a MVP!” that may be incorporated into future online promotions of the Microsoft “I’m a PC!” campaign. Indeed, this surprise added an extra ‘flavour’ to this meaningful Summit. The opportunity to catch up with fellow Worldwide MVPs, product group, executives and Microsoft CEO Steve Ballmer coupled with good food are the quintessential ingredients for a great MVP Global Summit! I leave the MVP Global Summit with this heart-felt wish – that we may once again re-connect with one another as the evening progresses and that we may continue to extend our MVP community network through similar Summit in the years to come! For those who has a copy of the conference set, be it you received it from TechFest or via the TechEd event itself, here’s an update on the Silverlight app which is on the disk. Check out the link above. If you are an IT Professional or Developers, you would want to sign up for these free newsletters from Microsoft. The newsletters are unique as they are usually very technically inclined. In Singapore, there are 2 newsletters which will keep you in touch with the products/technologies/what’s hot and how-to type of newsletter. Skydrive is now in SouthEast Asia !!! Skydrive is now in SouthEast Asia. Countries covered are Indonesia, Malaysia, Philippines, Singapore and Thailand. Ever want to show pictures to friends or family when you’re not at home? Or edit a document you’re working on when you’re out of town? With Windows Live™ SkyDrive, you can store up to 5GB of files that you can access from virtually anywhere! All you need is a computer and an Internet connection. And your information is protected too – it can only be accessed using your Live ID username and password. It’s up to you who sees what, and SkyDrive is integrated with other Windows Live services. No more worrying about losing your documents or misplacing a flash drive. What’s new in this release of SkyDrive? · Comments. You can leave comments on any file in SkyDrive and see all of the recent comments people have left for you. · Larger photo previews – we’ve made the photo previews even bigger. How many files does 5 GB really let people store? 5GB of free storage equates to approximately 30,000 Office documents of average size, or 30,000 digital photos at a resolution of 1200×1200. Is there a limit to the size of individual files uploaded? Yes, there is a 50MB limit on each file uploaded.